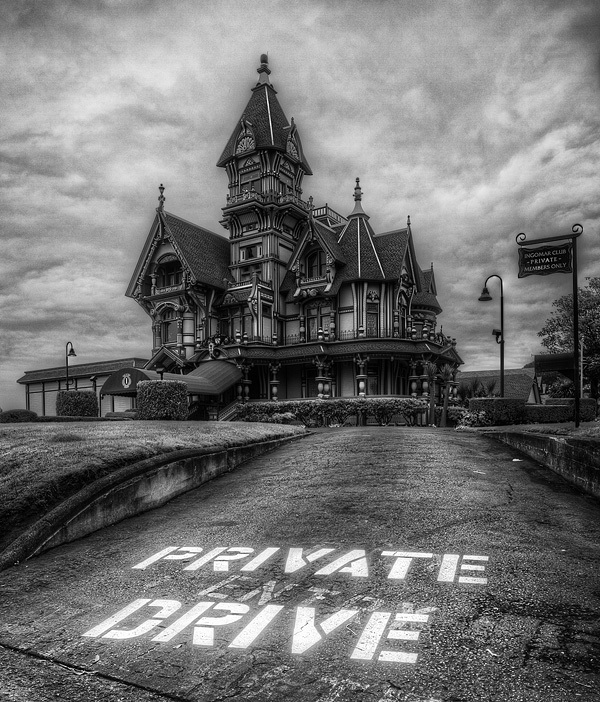 A Victorian mansion in Eureka, CA, clearly states that it is a private club. HDR made from a single RAW file. Yes Rob. It is a bit out of the way (sorry Eurekians…) but it’s got very nice and quite unique Victorian architecture. WOW ! This is amazing. Disney Tower of Terror worthy. Totally! It is the Carson Mansion, the pride and joy of Eureka, a Northern California lumbering town. Thanx very much Norma. In the B&W conversion, I used a green filter to bring the details of the house as otherwise, they blended too much with the darker frames. I don’t think the Adams family would be out of place here. I would LOVE to reside there even if it means sharing a pad with the Addams family! 😉 Thanx for the visit! Great!!!! I love your pic and the treatment!!!! I googled to see more images and I DO prefer yours!!!! Thanx very much ilargia for your kind words! It’s funny because I did not know that this house appears so often in photographs. I had stopped for a night in Eureka because it was a convenient stop (and I liked the name). While there, the hotel staff recommended to go see the house and that’s what we did in the morning just before driving back to SF. The picture itself was a bit boring with overcast skies so it stayed unprocessed until I dug it up for this week’s challenge. I had to go down 3 stops to get texture from the skies. Awesome! I just started HDR and can’t wait to get to your level (hopefully I will one day!) Great picture, really great! Thanx very much Suze and have fun experimenting with HDR software. It is a great tool!